Destiny. This is the word that sums up Elisabetta Faenza’s life. From childhood, she was diagnosed with a genetic disorder that threatened to take her out before she even got a chance to live. Constantly, doctors told her parents they would lose their daughter at a very early age. First, doctors said she would not make it to her third birthday. She did. The doctors then said she would not make it to five, then seven, twelve… She kept outliving their projections, or as she puts it, she found a way to change the genetic death sentence into a life sentence. 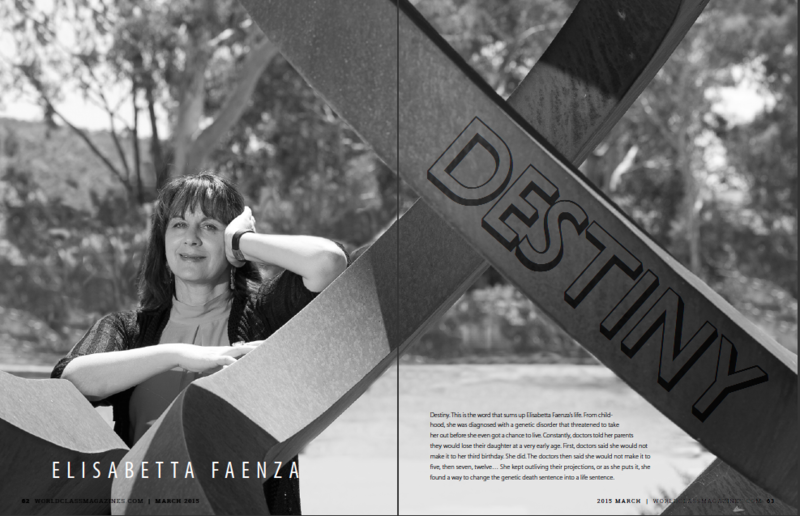 Elisabetta Faenza now empowers people to take charge of their lives as she has. She is a lmentor, a clinical hypnotherapist and an accomplished author. She helps people deal with crises and habits to develop themselves as grounded, well-balanced people who are able to achieve the goals they set. Elisabetta also helps organizations during mergers and takeovers. When a business changes ownership and seeks to introduce a change of culture, she is usually called in to help with the transition. Often, Elisabetta has been described as a coach for human potential. She has developed a series of models that help her diagnose a person’s great strengths and attitudes and establish how they can be used to achieve their highest possible value. She also helps people understand what they should be doing in the future. She does succession coaching where business leaders can pass on their leadership to other people and move on to their next calling. In helping people find their purpose, Elisabetta Faenza uses a timeline process. She gets them to divide their lives into decades, from birth to the present. She requires them to note what stood out most for them in each decade: what did they learn, lose, grieve and rejoice about in each decade? For each of those decades, she helps them draw meaning from those major events: what life lesson or rule or value did each of those experiences create in them? Elisabetta says people can have the same experiences but draw completely different meaning. She explains this using her life experience. Her terrible illness made her develop a good pain threshold. The death sentence she kept outliving helped her learn to project herself into the future and see what her life could become. She now does not look back at that time in her life as a bad time because she says it became the foundation of her character. Someone else may have gone through the same experience and may look back at that time with horror and fear. These past experiences affect a person’s present mindset. Looking at your life objectively is a core part of the process of deriving your potential. Elisabetta requires people to come up with the concept, as well as the tagline of their lives. “If you were to write the story of your life, what would your tagline be?” she asks. Elisabetta has written several books. Two of these are fictional works. 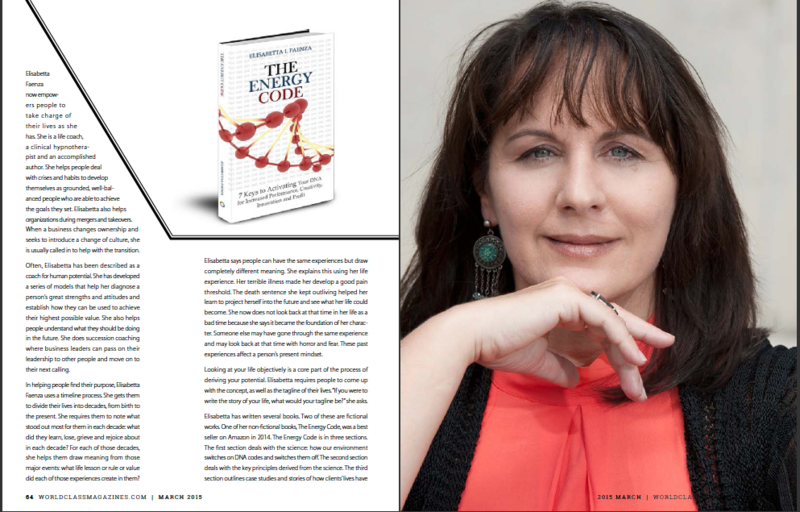 One of her non-fictional books, The Energy Code, was a best seller on Amazon in 2014. The Energy Code is in three sections. The first section deals with the science: how our environment switches on DNA codes and switches them off. The second section deals with the key principles derived from the science. The third section outlines case studies and stories of how clients’ lives have been transformed through the application of these principles. In the book, she shares seven keys that help you focus your energy on the things you want and switch off the things you don’t. The seven keys include mindset and productivity mode. Elisabetta says it is very important to understand the kind of productivity mode you are in. Seek to answer some of these questions: I am optimistic and positive in my attitude right now? Do I feel energized and capable for the task in front of me? I am prepared and excited about what I’m about to do? Elisabetta quotes a number of studies that have found that the electromagnetic fields emanated by a human being’s DNA communicate with the environment for a distance of at least ten meters around them. The electro-magnetic fields broadcast information that other people, animals, and things pick up. How that person is feeling radiates and is broadcasted out. This explains how a constructive, energized and passionate attitude can be infectious in an organization. People can change their emotional state by treating themselves as elite athletes. Consider the things you are doing and whether they are helping you perform at your best or making you sluggish. One of the biggest problems in organizations is people showing up at work but staying mentally absent. An organization should create an environment where people can decide where their best level of productivity will be. Elisabetta has begun a new program called Activate DNA. It takes people through a 12-month program of developing themselves and achieving a high productive value end. Those who register for this program will receive a series of documents, audios, and videos. They can also send their questions to her via email. She also will be organizing small group conferences and video calls via Udemy and Google Hangouts where she will show some videos and demonstrate some tools to participants. Because of her condition, Elisabetta Faenza has to have a good diet. She also has to keep her protein levels low. She says she mainly eats fresh fruits, but she is not a vegetarian: once in a while, she eats fish, chicken or red meat. Elisabetta says she helps people look at how they participate in the activities they do not like. She listens to them and then asks them questions that help them look at their circumstances from a different perspective. This way, they are able to update their programming into something more productive. She advises people seeking to expand their vision to find a mentor. “It’s important to choose someone who is achieving the things that you’d like to achieve or has the outlook that you’d like to have and ask them if you can hang out with them,” she says. She also advises them to change their environment and stop checking in with people who made them the way they were. 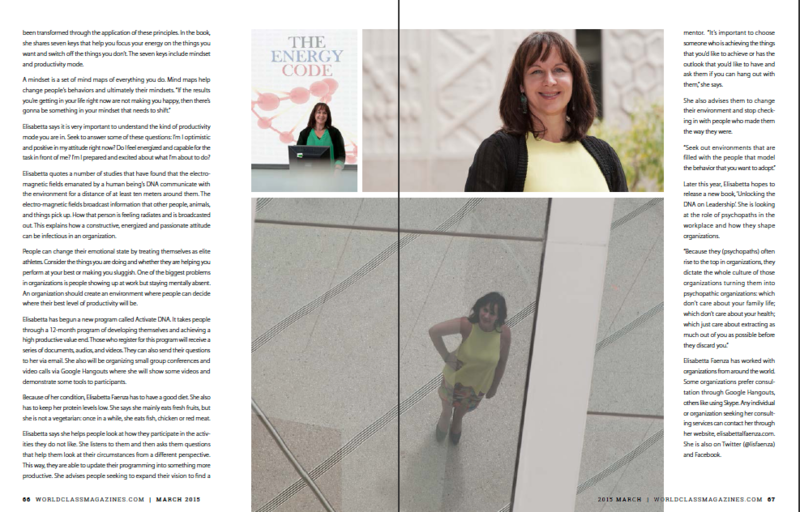 Later this year, Elisabetta hopes to release a new book, ‘Unlocking the DNA on Leadership’. She is looking at the role of psychopaths in the workplace and how they shape organizations. Elisabetta Faenza has worked with organizations from around the world. Some organizations prefer consultation through Google Hangouts, others like using Skype. Any individual or organization seeking her consulting services can contact her through her website, elisabettalfaenza.com. She is also on Twitter (@lisfaenza) and Facebook.